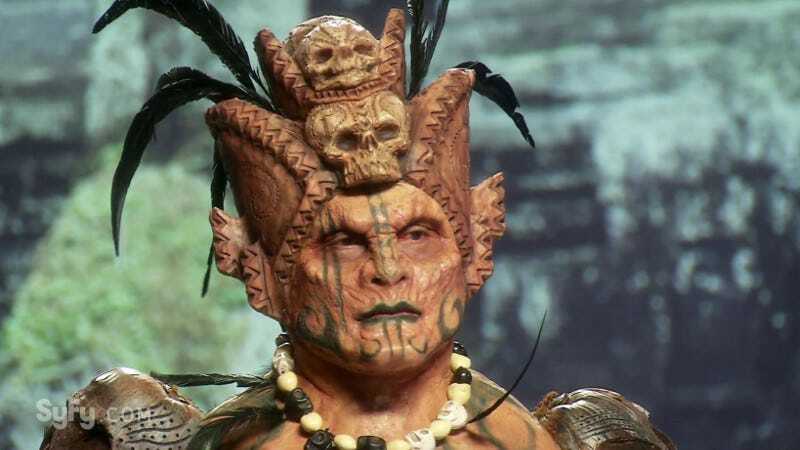 This week on Face Off the remaining All-Stars are tasked with creating Hawaiian gods. Plus a popular guest judge returns. Who will be saying mahalo to the judges and who will be sent out to the lanai? Results ahead. McKenzie Westmore greets the final five contestants at the lab to present this week’s challenge. The contestants each choose a Tiki figure associated with a particular deity to base a design on. The models for this challenge are actually dancers and they will participate in a dance on the reveal stage. Still, it’s a relatively simple and straightforward challenge. Lois Burwell returns to be a guest judge this week. The tide turns from last week. George was a Bottom Look last week but his sea turtle inspired look for Kanaloa nabs him a Top Look this time. Cig’s Ku (top image) looks the most like a Polynesian god (arguably the only design that really looks godlike). It stood out to me even before he finished applying and painting the pieces. The judges are similarly impressed. Cig is a Top Look and wins the challenge. Tyler goes big with his Kane design. Emily warns him about doing something similar to his witch a few weeks ago (the judges hate repeating looks) but Tyler plows ahead. The result doesn’t wow the judges. Ve calls it a theme park on the model’s head. Tyler isn’t a Top Look but he isn’t a Bottom Look either. Emily chooses Pele and goes for a lava look. Along the way she realizes the design isn’t working but she continues on to make the best of it. She goes from a Top Look last week to a Bottom Look this time. While her concept is flawed (like the inverted mohawk thing) she did start with a clear concept though. Logan has trouble nailing down a clear concept for his Lono. He ditches the pineapple head idea he started with and adds body tattoos but never really pulls together a cohesive look. He is a Bottom Look and is eliminated this week. So for the semifinal next week we have the members of the two top teams from the start of the season - Emily, Tyler, Cig, and George.